Following his first workout of the spring J.P. Crawford found himself standing outside the clubhouse at Spectrum Field flanked by a group of reporters. He smiled just as the first question was asked, acting almost as if he knew what was coming. Crawford, 22, is the Phillies' top prospect and is expected to break into the majors this season. Before he cracks the lineup at Citizens Bank Park though he still has some unfinished business to tend to in the minors. He struggled over the final four months last season at at Triple-A Lehigh Valley, hitting just .244 over 87 games. "I tried to do too much last year when I got moved up," Crawford said. "I was trying way too much with the bat, and physically I was just trying to do too much. This year, I’m trying to go back to what I do best. Stick with a plan and produce offensively." Crawford acknowledged he failed to execute on his approach at the plate when he was promoted in mid-May following early-season success at Double-A Reading. He also admits the difference in ballparks - Reading being more hitter friendly than Lehigh Valley - played a role into how he handled at-bats. "I felt like I was trying to do more than I should have," Crawford said. "When I got into hitters' counts I was getting way too big. I'd go out of my comfort zone, go away from my plan and try to do way too much. I was rolling over. I know I could have driven the ball. When I got to Triple-A I just tried to do way too much at the plate. I put too much pressure on myself." Crawford has been ranked the Phillies No. 1 prospect for four consecutive seasons and is regarded as one of the best future shortstops in all of baseball. "He's going to be a special one, for sure," said manager Pete Mackanin. "He just needs to put it all together for an extended time in the minors and we'll see him up with the big club, no doubt about it." 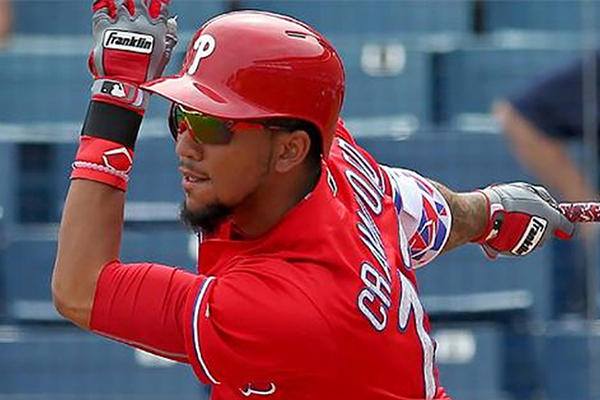 Freddy Galvis and Cesar Hernandez both are secured spots on the Phillies' roster that breaks camp, but once Crawford is deemed ready for the majors one of them will be without a starting job. "It's a good problem to have," said bench coach Larry Bowa. "Maybe not for an individual, but for the team it's a good problem to have." For now, Crawford has to put the work in and prove he can master his craft at Triple-A. Assuming things go well he could be playing in Philadelphia as early as June. “If I get that call, I’ll be blessed," Crawford said. "I worked my whole life for that. When I get up there, I still have to prove something. I have to prove that I can stay up there and compete up there. We’ll see what happens."